If the NHL is asking $550/600, I’m guessing the NBA would want a cool billion? The reporter on this story told me they’re estimating something like $1.4 billion in startup costs, though some of that may be for things other than the expansion fee. For reference, the NHL imposed a fee of $500m on the VGK owner, but advised him he was getting a great deal because the next expansion franchise would cost $650m (which is about what the NHL’s total turnover was in the late 1980s). Just what the NBA needs: a clone of the Pacers. A consistently-mediocre franchise in an apathetic market that will always always ALWAYS prefer the college game. That means my beloved city of Louisville has low self esteem. As someone that lives in the Louisville region in Indiana now but formerly of Jefferson County, KY city of Louisville, the Yum Center is nothing more than a big albatross around the neck of the Louisville taxpayers and those in Jefferson County as a whole since Louisville doesn’t exactly control all of the municipalities in Jefferson County. Considering that the Yum Center was built with about 350 million dollars in debt for an arena that has maybe 20 U of L basketball games in the mens program and similarly in the womens, the facility only has counting concerts and a few community events about 60 to 75 days of use in a year which out of 365 days isn’t quite going to cut it. Not to mention that the taxpayers of Louisville along with the businesses that make up the TIF district in downtown Louisville are being soaked by this arena that has to be subsidized by taxpayer funding at a rate from the city of Louisville at 11 million dollars a year. All because the honchos in charge aka former mayor Jerry Abramson and current mayor Greg Fischer along with Jim Host of Host Communications formerly part of the Louisville Arena Authority had this monstrosity built at a total cost over originally 30 years counting principal and interest on bonds along with maintenance etc at a total cost of 1 billion dollars over a period from 2010 to 2040. However, the bonds have now been extended to the taxpayers and city to pay for now until 2054 because the yearly payments to be made by the city and arena authority were only about 17.5 million a year from 2010 to current period because the interest on the bonds what was paid not the principal. So in essence the citizens/ratepayers/taxpayers of Louisville Metro aka Jefferson County, KY will be on the hook for this monstrosity for the next 36 years if they don’t want to build another facility somewhere plus another 30 million in government handouts for a soccer stadium. All at a time when Louisville has a huge drug and homeless problem along with crumbling streets and infrastructure so bad that your car gets damaged driving downtown in Lousyville because you end up hitting so many chuckholes and crevices that your car and its alignment, tires, etc become brittle. This mess that only has one major tenant being U of L is a textbook case in why government needs to start saying no to anyone and everyone that wants a new arena or stadium. Just like how the Louisville Metro Council gave a local business interest 30 million dollars and private developers that money in order to build a new soccer stadium. 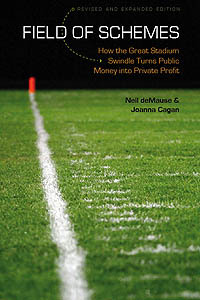 If the soccer facility or any other facility is such a bonafide winner then why doesn’t private industry and business support it and put their money into it rather than soaking the taxpayers at a time when fire and police pensions are in crisis, roadways are falling into disrepair and overall the citizens keep being taxed into oblivion for rich peoples benefit. Louisville’s location makes it a serious longshot to ever get an NBA team. It’s only 2 hours from the Pacers which is a strike right there and the popularity of high school and college basketball actually probably would work against them since the NBA would undoubtedly like to be the unquestioned king of the mountain. St. Louis would certainly be ahead of them in line to get an expansion team but once that happened that would be two sets of owners telling the NBA that Louisville would infringe on their markets. It’s not an inconceivable NBA market, but it has a way weaker case than, say, Hartford, which isn’t exactly a ringing endorsement.